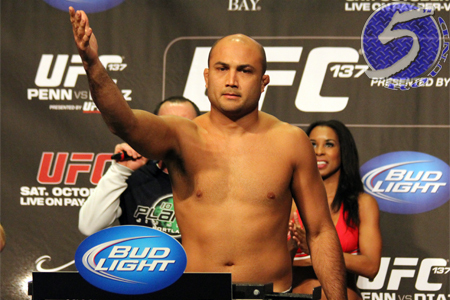 BJ Penn (pictured) might be done fighting, but the future UFC Hall of Famer isn’t done trashing MMA nutritionist Mike Dolce. Penn looked slow, sluggish and not himself against Edgar. In fact, it was the worst performance of his illustrious career. Dolce revealed to MMAJunkie this week that he had “very little influence” during Penn’s camp. Dolce felt he was always on the outside looking in, and whatever advice he gave fell on deaf ears. However, in an extensive rant on BJPenn.com, Penn claims that when he needed Dolce the most, he was nowhere to be found. “I turned down the I.V., so Dolce made an attempt to rehydrate me in a different way that he does,” Penn said of what took place after weigh-ins. “I woke up the next day (fight day) at 150 (pounds) and I ate this much food for the 13 hours before the fight that day. (Shows Page from Dolce’s diet log). “Dolce didn’t come to check on me, or monitor my weight, and I couldn’t get in touch with him. I don’t feel there was any real attempt to get back to my sparring weight after weighing in. From all my years of experience in the UFC, every second counts from the scale to the cage, and Mike Dolce didn’t share the same mentality as I did. Obviously, only a few people know what actually took place during Penn’s camp, and there’s great incentive for Penn and Dolce to stick to their respective stories. Is Penn searching for an excuse as to why his career ended on such a sour note? It’s also a tougher sailing off into the sunset riding a three-fight skid. Did Dolce not hold up his end of the bargain? Anytime a fighter worries about making weight, Dolce is supposed to be the fool-proof weapon you call up from the bullpen. If he can no longer come through, then what does he really have to offer? The good news for Penn is that he is now free and clear to eat anything and everything he wants. Dolce just wants him to cut down on the sour grapes.